he text of Memorare, which for a long time was attributed to St Bernard of Clairvaux (1090-1153), was originally part of the fifteenth-century prayer Ad sanctitatis tuae pedes, dulcissima Virgo Maria. As it was popularised in the seventeenth century by the French monk Claude Bernard (1588-1641), most likely his name forms the basis for its customary attribution to his illustrious namesake from the Middle Ages. The composition is not based on a Gregorian chant. From a declaimed first line, the composer develops a melody that presents the first half of the text in one long phrase. With an occasional variation the entire melody is repeated over a musically almost identical, but subtly rewritten organ part. The contrasting second part, consisting of several musical sections, is a constantly modulating setting in alla breve metre with a floating rhythm that is characteristic of Diepenbrock in the organ. Despite its very chromatic setting, this accompaniment supports the voice adequately too. The part is interrupted by the final line of the text “Noli, Mater Verbi, verba mea despicere, sed audi propitia et exaudi” that is recited on one tone and then repeated in a setting that partly draws on the beginning of the second part. A very characteristic element in the accompaniment that stands out is the harmonisation of the words “mea despicere” – a succession of chords that can be found in many of Diepenbrock’s works. This is followed by the first part, without any repeat. The composition concludes with a slowly fading organ postlude. Written at the request of the tenor J.J. (Johan) Rogmans, the Memorare was created when Diepenbrock was affected by the critical health situation of his mother who paralysed and speechless was bedridden. (BD IX:47-48) Already in June 1902 Rogmans sang the work in the basilica in Lourdes in the presence of Diepenbrock’s brother Willem. Memorare was published in 1916 as a supplement to the first edition of De Beiaard, a new periodical edited by the literary scholar and art historian Gerard Brom who was an advocate of far-reaching emancipation of Roman Catholicism in the Netherlands. Diepenbrock took a lot of care making a copy of B-12(1) which he sent Brom on 1 February 1916 and which was used for the edition (in facsimile). The popular, non-liturgical Memorare is said to be a prayer of the “Honey-Tongued Teacher” Saint Bernard, who never literally spoke out as such, only in some sermons did he give the motive of this devout lament which was elaborated on by later generations [...]. In 1917 Diepenbrock rewrote the vocal part to adapt it to an Italian translation; the organ accompaniment was replaced by a more adequate setting for piano (see RC 136). Memorare, o piissima Virgo Maria, non esse auditum a saeculo quemquam ad tua currentem praesidia, tua implorantem auxilia, tua petentem suffragia esse derelictum. Ego tali animatus confidentia ad te, Virgo virginum Mater, curro, ad te venio, coram te gemens peccator assisto. Noli, Mater Verbi, verba mea despicere, sed audi propitia et exaudi. Gedenk, o mildste Maagd Maria, dat het van eeuwigheid niet is gehoord, dat iemand die tot U zijn toevlucht nam, Uw hulp inriep, Uw voorspraak afsmeekte, verlaten is. Door zo'n vertrouwen bemoedigd, ijl ik naar U, Maagd der maagden, Moeder, naar U kom ik, bij U verwijl ik, zuchtend zondaar. Wil, Moeder van het Woord, mijn woorden niet versmaden, maar luister genadig en verhoor ze. 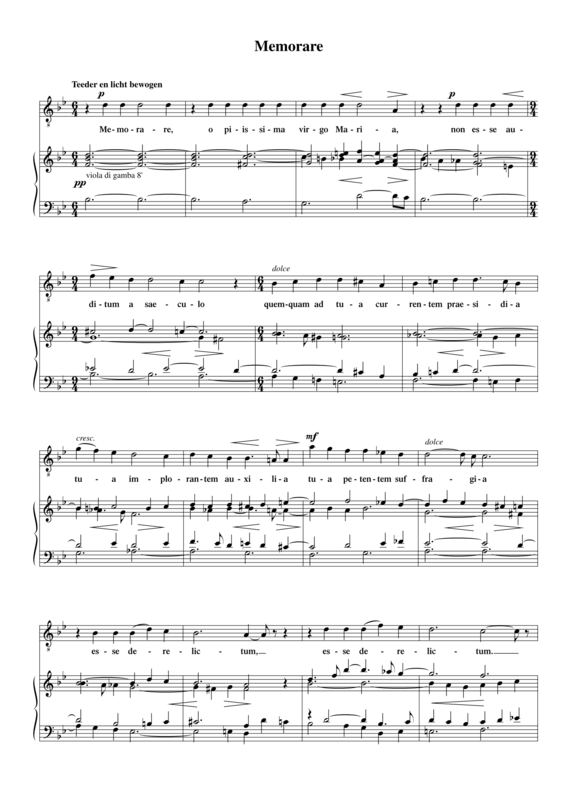 27 dec 1905: Uitvoering van Jesu dulcis memoria (RC 24) en Memorare door Gerard Zalsman resp. Johan Rogmans met orgelbegeleiding van Evert Cornelis tijdens een kerstconcert van de Liedertafel Apollo onder leiding van Fred. J. Roeske in het Concertgebouw te Amsterdam. Voorts worden uitgevoerd werken van Bach, Löser, Verhulst, Guilmant, Mozart, Daniël de Lange, Gounod en Röntgen. Een Concert door de Liedertafel “Apollo” gegeven, slaagde niet gelukkig, zoodat wij ons van bijzonderheden willen onthouden en liever wachten tot deze vereeniging eens revanche neemt. — Echter moeten wij even vermelden dat Gerard Zalsman en Joh. Rogmans nieuwe, althans nog niet gehoorde compositiën van Alph. 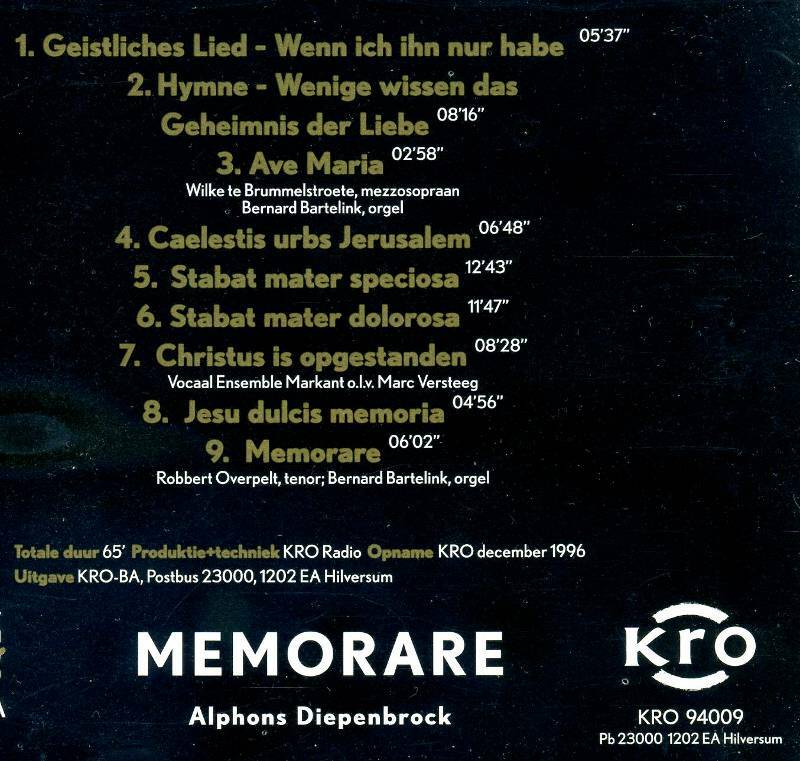 Diepenbrock voordroegen: Jesu dulcis memoria en Memorare, die een interessante kennismaking waren. — De heer Evert Cornelis deed zich met solovoordrachten en met de begeleiding der koren weer als een voortreffelijk organist kennen.